These days there seems to be a real surge in all things open science. At least it’s the talk of the town. Having visited the Open Science Conference 2017 in Berlin and witnessing the many discussions on Twitter at the venue it seems clear though that ideas on what Open Science is (or could be) vary tremendously. Rather than see this as a problematic lack of focus, or as a sign that it is too early to define what open science is or not, we’d argue that the scope of open science and the variety of actors involved make it not realistic, and even counterproductive, to expect there to be, now or in the future, one definition of open science that fits all. To get things done, any one researcher or other stakeholder involved cannot act on all aspects of open science simultaneously, so choices will be made. The outcomes of these choices will be different for different people, disciplines, organizations and countries. However, it is good to be aware of the different opinions people have on what open science is and could be, both to facilitate understanding each other’s actions and motivations, and to foster productive collaboration towards better scholarly communication at an individual, institutional or (inter)national level. The choices people and organizations make on what they see as most important and perhaps also most realistic determines how they define open science. Broadly, we can categorize 5 types of definitions. 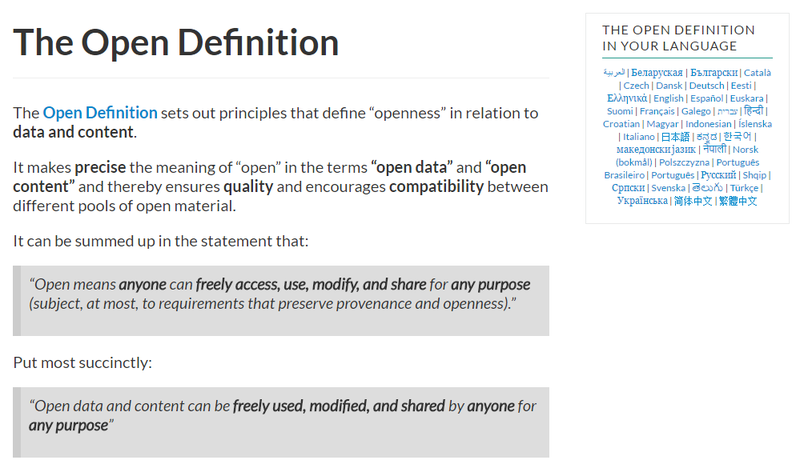 Before we turn to these different types, it’s useful to look at some early definitions, including the one by Open Knowledge International (OKFN), that in 2005 issued the Open Definition: “Open means anyone can freely access, use, modify, and share for any purpose (subject, at most, to requirements that preserve provenance and openness).” The Wikipedia article on Open Science, started on August 5, 2006 by Aaron Swartz, now uses this definition: “Open science is the movement to make scientific research, data and dissemination accessible to all levels of an inquiring society, amateur or professional. 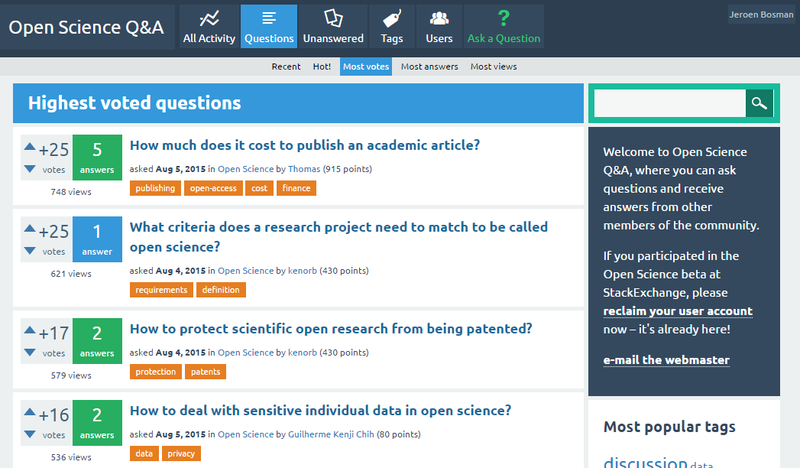 It encompasses practices such as publishing open research, campaigning for open access, encouraging scientists to practice open notebook science, and generally making it easier to publish and communicate scientific knowledge.” Historically open science proponents arose from the open source movement that already had their Free Software definition (1986) and the Open Source definition (1998). Broad definitions using selective interpretations can be very strong and are often used to get multiple stakeholders to agree on action. An example of this is the Dutch National Plan Open Science, focussing on open access, open data and adding evaluation alternatives. The Dutch national plan uses the EU definition from the Open innovation, open science, open to the world report: “Open Science represents a new approach to the scientific process based on cooperative work and new ways of diffusing knowledge by using digital technologies and new collaborative tools. The idea captures a systemic change to the way science and research have been carried out for the last fifty years: shifting from the standard practices of publishing research results in scientific publications towards sharing and using all available knowledge at an earlier stage in the research process“. While making choices as well, the European Union seems to take a much broader approach by for instance explicitly including the promotion of citizen science and outreach and engagement initiatives. That is something our own university seems to go for as well . The Open Science monitor recently launched by the European Union also shows that the EU takes a broader perspective. 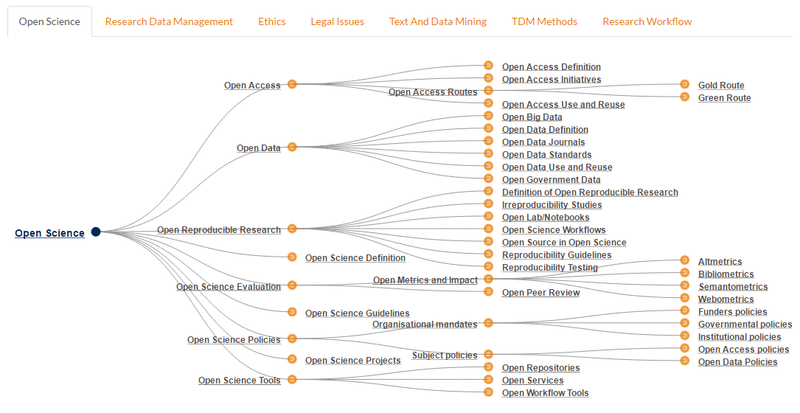 European Union Open Science monitor. Click to dive into the data. 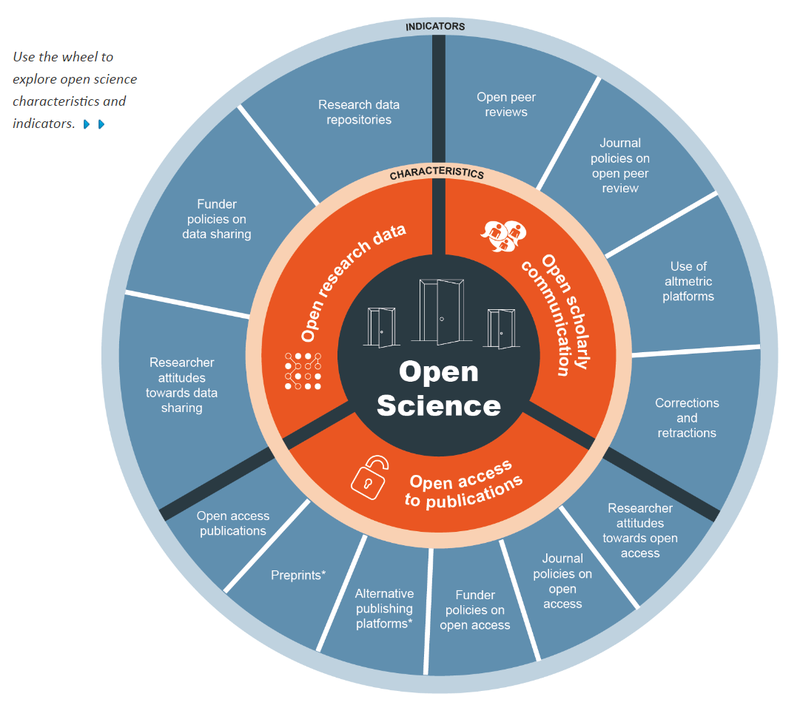 In Making open science a reality (2015), the OECD takes a similar approach of using a broad basic definition and focussing on a limited number of issues: access, data and collaboration. Though many will agree that the topics selected by the EU, OECD and in the Dutch National Plan are important issues, others may argue that without adding the context of inclusivity (especially incorporating issues and discussion in the Global South) its potential value is still limited. Maximal definitions accommodate all developments that could be relevant to making science and knowledge more open. Their goal is not so much to define but to inventorize, link and organize ideas and developments. The often used taxonomy by Foster (an EU-project using Open science is the movement to make scientific research, data and dissemination accessible to all levels of an inquiring society as definition) plays this role. The text version of Foster’s Open Science definition is: “Open Science is the practice of science in such a way that others can collaborate and contribute, where research data, lab notes and other research processes are freely available, under terms that enable reuse, redistribution and reproduction of the research and its underlying data and methods.” Note that this definition is somewhat narrower than the Foster taxonomy, leaving out the explicit mention of evaluation. An alternative taxonomy is the list we created ourselves. 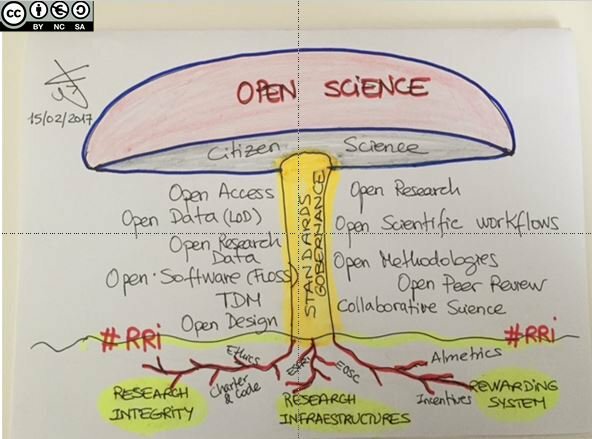 Our list looks at aspects of open science within an open knowledge framework, because Open Science does not develop in a vacuum and is part of a broader movement towards open knowledge. It partially overlaps with developments towards open source, open hardware and open educational resources. And open access and open data, by many considered integral to Open Science are also movements in their own right, for instance pushing for open government data. One might say that overall there are six SHADES of open. The list aims at broad coverage, without looking at barriers to implementation. It highlights priorities in the Dutch national Open Science Plan (in red) and the things that Utrecht University on top of that will probably also cover in its Open Science ambitions (in blue), as apparent from its Strategic Plan 2016-2020. There are also practical definitions that while denoting what is the core of Open Science still leave room for many different implementations. A nice example is the definition by Egon Willighagen, which echoes the Open Definition. A final group is the catchphrase definitions, that have the aim to sell the idea more than strictly define it. They often make great discussion starters. There is a nice collection of Open Science catchphrases. One example that we would like to share here is: “Open Science = Science done according to its definition” by Graham Steel. We definitely do not want to say what kind of definition is better or more useful. Let’s keep this discussion alive and see what interpretations bring broad and speedy progress without harming those that have a different interpretation. One way to do this is by exploring and discussing practices and tools that can be used and adopted to make aspects of open science a reality. From our own research in the project 101 Innovations in Scholarly Communication, and from the many workshops and meetings with researchers and other stakeholders we learned that some developments are smooth-running while others go slowly. 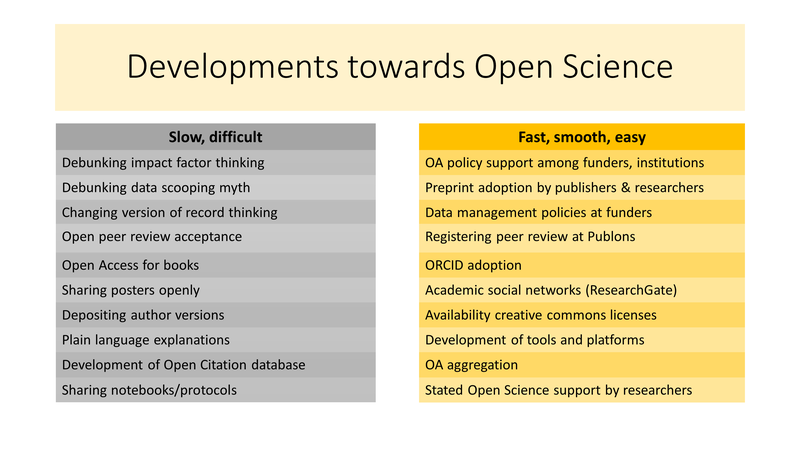 In the end it’s perhaps more important to deal with the motivations and barriers that determine the speed of developments towards Open Science, than worry about the exact definition of it. This work is licensed under a Creative Commons Attribution 4.0 International License, excepting the image by Eva Mendéz.